Kerin O'Keefe is a wine critic and author, Italian Editor for Wine Enthusiast since May 2013. From 2002 to 2013 she wrote regularly on Italian wine for Decanter and from 2004 for The World of Fine Wine. She was also Contributing Editor for The Wine News from 2003 to 2009. Kerin O’Keefe holds a degree in English Literature from the University of Massachusetts Amherst and also studied English and American literature for a year at the University of East Anglia. O'Keefe has a keen interest in fine Italian wine made from autochthonous grape varieties. She has been acknowledged to be "one of the great wine commentators on Italy" and "a critic in the best sense of the word, not shy with her opinions, which she offers without polemics or bluster." 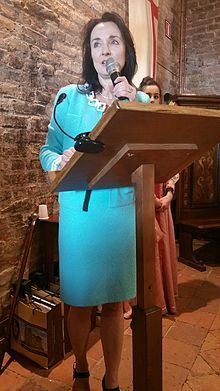 She was named Honorary Knight by the Ordine dei Cavalieri del Tartufo e dei Vini di Alba on April 7, 2017. Her first book was published in Italian by Luigi Veronelli in 2004: Franco Biondi Santi. Il gentleman del Brunello. She authored the English edition of the book in 2005, Franco Biondi Santi. The Gentleman of Brunello, a recipient of a Gourmand Wine Books Award. She also won the Premio Consorzio Brunello di Montalcino in 2008 for her cover article "Brunello de-con-structed" in the Oct-Nov 2007 issue of The Wine News. Brunello di Montalcino - Understanding and Appreciating One of Italy's Greatest Wines, (University of California Press, 2012), gave Montalcino and its wines the in-depth treatment they deserved. Her latest book, Barolo and Barbaresco - The King and Queen of Italian Wine, (University of California Press, 2014), filled a gap in the wine literature by helping consumers understand the differences among the various sub-zones of Barolo and Barbaresco. In The Times Literary Supplement Tim Crane put her in the Clive Coates/Michael Broadbent camp of wine critics, rather than in the Robert Parker camp of "loud and fruity descriptions". Her article "Rebels without a cause? The demise of Super-Tuscans" was discussed by Eric Asimov in The New York Times and spurred a lively debate on the merits of Super-Tuscans. The Brunellopoli scandal was not a surprise for O'Keefe, as she had been questioning Brunellos which were suspiciously dark and without the typical aromas of pure Sangiovese wines for years. O'Keefe wrote in 2003 that many of 1997 Brunellos she had tasted: "were so jammy it was hard to believe they were Brunello", in 2006 that: "illicit blending with other grapes, to make luminous ruby-garnet color unnaturally darker, is staunchly denied on all official fronts" and in 2007 that: "Doubts can only remain in the face of some of the darker, impenetrable Brunellos sometimes seen". O'Keefe opposes the view held by many about the so-called American Palate, or the preference for highly oaked, sweet and powerful wines. She maintains it is a crass stereotype to believe that an entire nation has a uniform taste with respect to wine. She argued instead that US wine drinkers have shown a growing appetite for more balanced and drinkable wines. 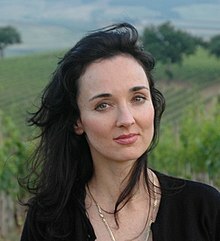 ^ a b c "Kerin O'Keefe Named New Italian Editor for Wine Enthusiast Magazine". Wine Business. 22 April 2013. ^ a b Bordoni, Jessica (Summer 2016). "The wine writer". Exploring Taste. ^ a b c Speller, Walter (26 March 2013). "Kerin O'Keefe's Montalcino subzones". JancisRobinson.com. ^ O’Doherty, Paul (2 January 2015). "Books of the year 2014". JancisRobinson.com. ^ Asimov, Eric (10 December 2014). "Sip and Turn a Page". The New York Times. ^ "I Cavalieri del Tartufo e dei Vini d'Alba hanno incontrato la "Wine Enthusiast" Kerin O'Keefe". TargatoCN. 9 April 2017. ^ KFS (Oct–Nov 2008). "Resident Italian expert earns high Brunello honors" (PDF). Wine News. ^ a b Dawson, Evan (28 March 2012). "An Honest Look at Brunello". Palate Press. ^ O'Doherty, Paul (26 December 2012). "2012 wine books - Italy". JancisRobinson.com. ^ Maresca, Tom (4 June 2012). "The Best Brunello Book Yet". Tom's Wine Line. ^ a b Certomà, Chiara (November 2013). "Book Review - Brunello di Montalcino". Journal of Wine Research. 24 (4): 328–330. doi:10.1080/09571264.2013.858855. ^ a b Levenberg, Keith (2012). "Brunello's true believer" (PDF). The World of Fine Wine (37): 38–39. ^ a b Crane, Tim (1 August 2012). "The Grace Kelly of wine". The Times Literary Supplement. ^ Bonné, Jon (3 October 2014). "A bounty of books about wine and spirits". San Francisco Chronicle. ^ Asimov, Eric (29 October 2014). "Good Barolo rewards patience". The New York Times. ^ Taylor, Charles S. (2015). "Barolo and Barbaresco: the King and Queen of Italian Wine". Journal of Wine Research. 26 (1): 66–68. doi:10.1080/09571264.2015.1009016. ^ Belfrage, Nicolas (2015). "A measured, informative and very readable tour of Barololandia" (PDF). The World of Fine Wine (48): 52–53. ^ Maresca, Tom (17 October 2014). "A New Book on Barolo & Barbaresco". Tom's Wine Line. ^ McCarthy, Ed (9 September 2014). "A Great, New Book on Barolo and Barbaresco". Wine Review Online. ^ Dawson, Evan (28 June 2015). "Barolo and Barbaresco: A Conversation with Kerin O'Keefe". Palate Press. ^ O'Keefe, Kerin (2009). "Rebels without a cause? The demise of Super-Tuscans". The World of Fine Wine (23): 94–99. ^ Asimov, Eric (13 April 2009). "Are Super-Tuscans Still Super?". The New York Times. ^ O'Keefe, Kerin (February–March 2003). "Vintage of a Lifetime". The Wine News. ^ O'Keefe, Kerin (2006). "Brunello's Moment of Truth" (PDF). The World of Fine Wine (11): 74–80. ^ O'Keefe, Kerin (October–November 2007). "Brunello De-con-struct-ed". The Wine News. ^ O'Keefe, Kerin (April 2011). "US love affair with Italy". Decanter. ^ O'Keefe, Kerin (2012). "Italy and the American Palate: debunking the myth". The World of Fine Wine (37): 79–83. Wikimedia Commons has media related to Kerin O'Keefe. This page was last edited on 6 April 2019, at 07:07 (UTC).